For a brief history of the Mark VIII Spitfire and the a look at the original release of the Eduard 1/48 Spitfire Mk.VIII, please look here. Here is another of Eduard's special releases which is a combination of two complete kits and a special book. I'm not sure if this is a book release with two free kits or a dual combo release (two kits) plus a free book. Either way, any Spitfire lover that acquires one of these will be happy indeed. This set focuses on the Spitfire Mk.VIII in Australian service. 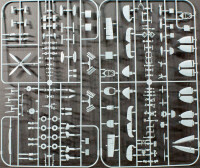 The decals are nicely printed and include a set of airframe stenciling for each kit. The title is full of color profiles and period photographs and is all written/published in English. What is interesting is that the booklet that is also included which illustrates the decal subjects states that the decal color profiles are rendered without weathering and that you should use the photos in this book to understand the weathering on these aircraft. Are folks really complaining that there is no weathering shown in decal profiles? 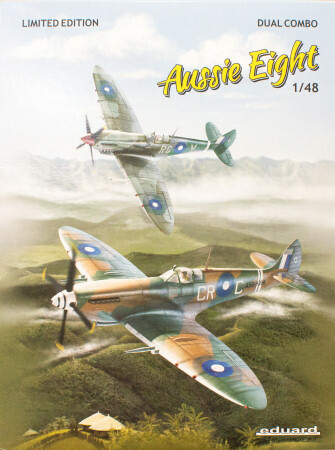 Whether you buy the book with the free kits or the Dual Combo kit with the free book, this is a really nice release for modeling the RAAF Spitfires with a variety of camouflage schemes to choose from.